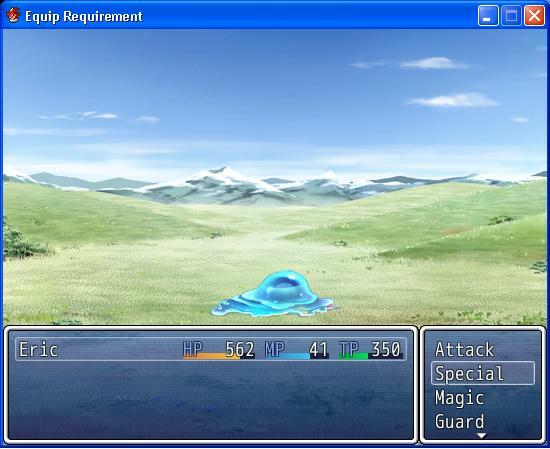 By Tsukihime, May 20, 2012 in Completed Scripts/Plugins/etc. This script extends the TP system by allowing you to specify arbitrary amounts of TP your actor can have, how much TP a skill costs, as well as influencing the damage of a TP skill by increasing your TP power level in battle. TP Level is how much power you are using for your TP skills. The higher the level, the more the skill costs, but the more damage you inflict. You can increase/decrease your TP level in battle by going to the battle skill menu and pressing the S or A keys. The formulas for TP cost and TP damage multipliers can be customized at the top of the script, but you are limited to formulas related to the TP level. At the top of the script is a global TP table. All actor TP availability will follow this table. I will extend this script to support more options if there are requests for it. Can you make it so a TP skill has a variable TP cost and is more effective the more TP you have? Say an Actor can have up to 300 TP, but can use a Sword Skill for minimum of 100 TP. At 100 TP the sword skill would do 2x damage, but at 200 it would do 2.5x and at 300 it would do 3x, all which use up all available TP? Maybe required TP = 100% damage, and then the bonus damage is from the Consumed_TP / base_TP ratio? I've updated the script with the actual TP Level feature that I wanted to write. The idea is simple: you can choose how much power you want to put into your skill by increase your TP Level. By default your TP Level is 1, which is just normal damage. By increasing it, you increase the cost of the skill, but you also increase the amount of damage you inflict. Only skills that use TP will be affected. So if you have a skill that doesn't cost any TP, then they will not receive any bonus damage. You can customize which keys are assigned to the power-up and power-down functions. By default they are A and S, and you use them in battle skill menu. And also, what does "FP" stand for? I am currently looking into your suggestion of consuming all TP and increasing the damage based on the amount of TP used. I also want a nice graphic that will show you your current TP level. Maybe someone can make one for me. What do you mean by "TP Level"? It refers to how much power you're putting into your TP skills. I don't know if this is an issue with your script or Yanfly's but one thing I noticed while using this script in unison with Yanfly's Battle Ace Engine script is that whenever I hit an enemy with its elemental weakness, the "Weakpoint" message that usually appears does not. It's kind of annoying so I was wonder if it would be possible for you to look into it.